Above is an illustration I photoshopped just now, after reading that Thomas Kinkade died. I combined one of his typical posters with a waif painted by Keane. 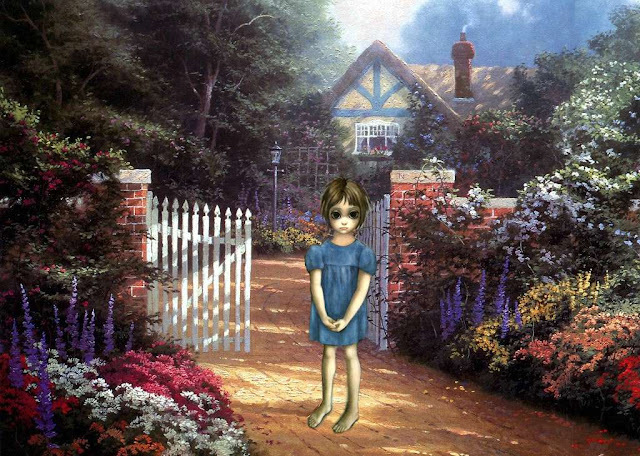 Before Kinkade assumed the mantel of kitsch-master sometime in the 1990s, Walt/Margaret Keane had dominated this genre in the U.S.
Kitsch is transitory. While Kinkade's sugary landscape looks familiar (part of our time, betokening CG films, Disney, etc.) the big-eyed waif looks foreign. Once a staple of popular visual culture (seen in millions of homes, and stacked in any thrift shop or garage sale), the Keane waif stands to be forgotten. Something of her sweetness, however, lives on in the Japanese esthetic for cure big-eyed products. Thomas Kinkade was a CEO, a procurer for what the populace wanted. Therefore it fits that we know not his face, but only his style. He's different from the likes of the Keanes, who aired their laundry in the public courts for decades, battling each other like characters in a Tennessee Williams play. In contrast, the Kinkade family is tight-lipped, offering a controlled statement to the press as to the CEO's passing, allowing us to only speculate as to the cause of death at the relatively young age of 54. Realism (Soviet, Chinese, N. Korean), or Fascism (German or Italian.) American kitsch is bottom up, the artist procuring for the wants of the masses. The other cited versions of kitsch are more top down, driven by authoritarian didactics, rather than mass market forces. Norway's most famous living painter, Odd Nerdrum, has yet more interesting ideas on the nature of kitsch. I've always liked Kinkade's art. It is pleasant and cozy looking, but at the same time it looks a bit too unrealistic for me to want to decorate my walls with it! The combination of Keane(s) and Kinkade is spooky. You're right that kitsch is transitory -- I hadn't thought of the Keanes in years myself.